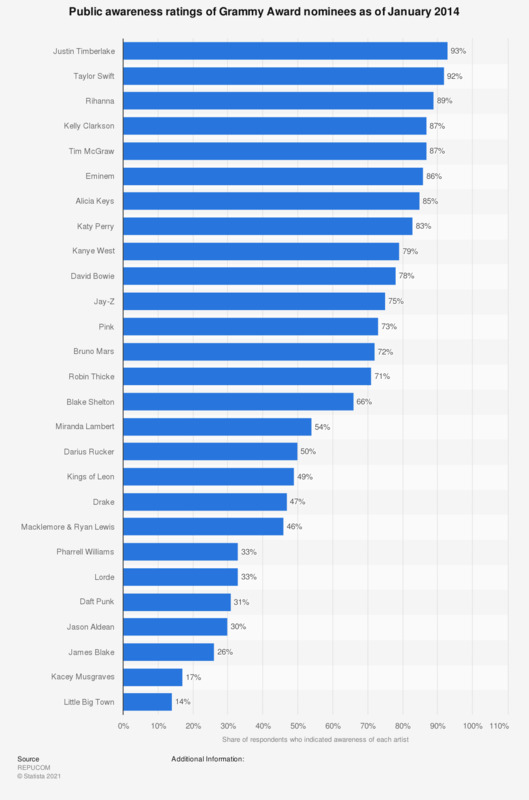 This graph displays the public awareness of a number of Grammy Award nominees before the 2014 Grammy Awards were held, shown as a pecentage of those interviewed who indicated having heard about a certain artist or band. Veteran musician David Bowie received an awareness rating of 78 percent, 32 percent more than reported having heard about breakthrough artists Macklemore & Ryan Lewis. Newcomer Lorde had only a 33 percent awareness rating before the Grammy Awards, but nonetheless received two Grammy Awards, including the coveted "Song of the Year" award. Numbers represent percentage of those interviewed who reported being aware of each artist The source does not provide a date of survey. The date given is the publication date. How much have you seen, read or heard about the 2019 Grammy Awards? How excited do you typically get to watch the commercials during the Grammy Awards? Which best describes your feelings about the Grammys?